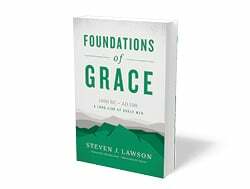 We are pleased to announce the much anticipated reprinting of Dr. Steven Lawson’s popular titles Foundations of Grace and Pillars of Grace. These titles feature newly designed covers and enhanced smyth sewn bindings, and are available now from Reformation Trust in the Ligonier store. In Foundations of Grace, Dr. Steven Lawson takes readers on a heart-stirring survey of the Scriptures and their teaching on God’s way of salvation. Dr. Lawson demonstrates that far from being a sixteenth century invention, the doctrines of grace are the clear teaching of the Bible in its entirety. From Genesis to Revelation, the Scriptures declare the message of God’s sovereign grace in salvation. In Pillars of Grace, Dr. Lawson shows that the doctrines of grace have been understood and taught throughout church history. From the time of the early church fathers to the era of the Reformers, key men in the church stood on the foundation of Scripture and upheld the truth of God’s sovereign role in salvation. The inescapable conclusion is that the doctrines of grace are no innovation, but the consistent witness of some of the greatest servants of the church. Dr. Steven J. Lawson is president and founder of OnePassion Ministries, a Ligonier teaching fellow, and author of numerous books, including Foundations of Grace and The Passionate Preaching of Martyn Lloyd-Jones.